India's existing web of federal and state sales taxes is levied at different stages of the supply chain and often results in double taxation, while forcing trucks to spend nearly a quarter of their road time in border checks or other inspections. 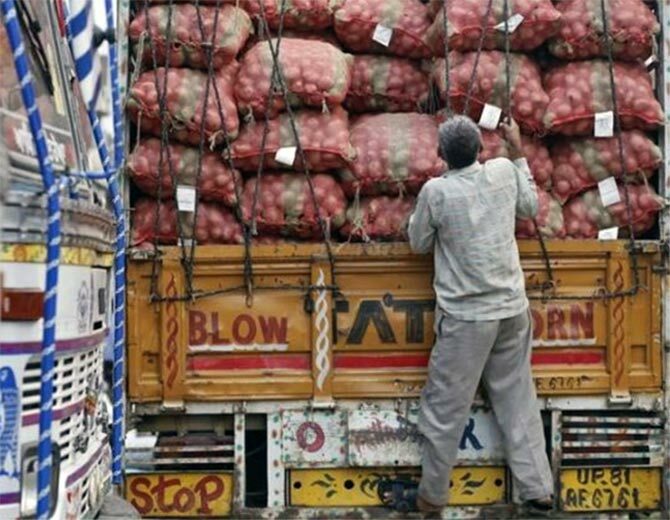 For years Indian businesses have lobbied for a nationwide sales tax, hoping to replace a chaotic structure that inflates costs and halts their trucks at state borders for duty payments, and to unify the country into one of the world's largest single markets. But after political compromises that finally got a goods and services tax (GST) bill before parliament, they have turned wary. India's top business groups are now calling for a slowdown in the process as they try to roll back those compromises, putting them at odds with Finance Minister Arun Jaitley who wants to push through what he touts as the country's biggest tax reform since independence nearly 70 years ago. "A delayed but improved GST would be far better than a hasty and flawed GST," said Bishakha Bhattacharya, a director at Nasscom, a premier IT industry body that represents Infosys and others in India's $150 billion export-driven outsourcing sector. But Jaitley wants no further delays and has set next April as the deadline for launching the reform, which he says will boost annual economic growth by 2 percentage points. If the proposal goes ahead in its current form, business leaders say, they will be stuck with a deeply flawed reform that could increase manufacturing costs and encourage imports - undermining Prime Minister Narendra Modi's drive to build up local industry and a borderless national market. Taxes add about 50 percent to the base price of Maruti Suzuki's popular Ciaz sedan from the time it leaves the factory gate until it drives out of the showroom, while the government estimates the average burden for all goods at about 30 percent. The proposed goods and services tax would subsume at least 14 federal and state levies, the government says. But to win support from states that fear losing revenue, the government has agreed to a 1 percent additional levy by states on the cross-border transport of goods, even on a company shipping products from one plant to another. The present system requires no such tax payments between plants. Past Indian governments have tried for years to push through a national GST but they became bogged down in political wrangling and heavy resistance from the states. Modi's year-old reform-minded government has vowed to push through the unified tax, which passed in the Lok Sabha and has been referred to a Rajya Sabha committee. The Rajya Sabha is expected to approve the measure after it goes into session later this month. Opposition is building, however, among businesses with operations spread across the country. A major steel manufacturer setting up a plant in one state but procuring raw materials from three others said its input costs would rise by 5 percent as charges accrue every time a truck crosses a state border. Companies are equally worried that the reform does not extend to real estate, one of the biggest revenue generators for the states, leaving them still subject to state taxes on plant and property, possibly including machinery. With no offsets under the new tax regime, they could face double-taxation on construction materials such as cement, steel and electrical fittings that account for nearly 40 percent of the cost of a new factory. "Such distortions create an import bias," said a senior executive at the major steelmaker, who spoke on condition of anonymity because of the political sensitivities of the issue. "It would be easier for businessmen to import rather than manufacture goods in the country." The shortcomings of the compromise plan have been acknowledged within the government. Arvind Subramanian, Jaitley's chief economic adviser, warned that the proposed interstate charge could upend Modi's plans for a Chinese-style manufacturing boom. "It has the potential to undermine 'Make In India'," he said. But the compromises were necessary to win the support of India's 29 states, more than half of which must ratify the GST bill before the tax can be rolled out. Jaitley says even a flawed reform will boost economic activity and hopes the benefits will encourage states to let it evolve into a better tax over time. Companies are not so sure. In a submission to the parliamentary panel reviewing the bill, the Confederation of Indian Industry, which has long lobbied for a national GST, suggested removing the provision for the interstate levy. It also urged that real estate, as well as alcohol and petroleum products, be brought under the new scheme. "Some of the provisions ... will bring more pain for the industry and will not be in the best interests of the country," the confederation told the panel. "Without a good design and structure, the GST would not be the 'positive-sum game' for the stakeholders as it was envisaged to be."